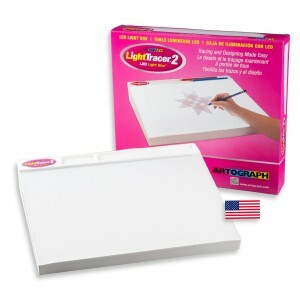 For larger, more complex tracing projects, take advantage of the LightTracer® II, with a generous 12 x 18 inch (304.8 x 457.2 mm) conveniently slanted acrylic tracing surface and handy recessed tool tray to keep pencils, chalk, embossing stylus, and other tracing tools at your fingertips. Illuminated by a long-life daylight 15-Watt fluorescent lamp (included). Electrically operated product. Adult supervision is required. Ages 15 and up. This entry was posted in Light Boxes, Light Tracer and tagged light box, LightTracer II, LightTracer light box on April 5, 2014 by Artograph.